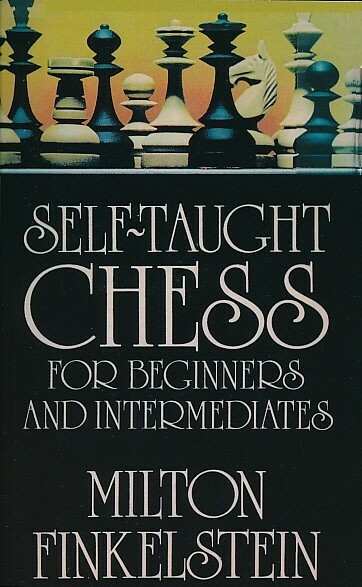 This book is perhaps unique in that it was written by a professional educator who also plays chess, rather than by a professional chess player who also wrote. Dr. Milton Finkelstein was Director of the New York City Department of Education who wrote several other books in the education field. A leading figure in American chess for more than thirty years, presents a simple and effective program for teaching yourself one of the oldest and most fascinating games in the world. With clear and easy to follow descritpions, he shows you the most basic moves, openings, gambits and defenses, but also how to practice and master a few good strategies that are key to successful play. You learn from the masters from separate chapters expounding over fifty games by such well known champions as Fischer, Spassky, Farpov and Petrosian, each game chosen to illustrate a particular aspect of play. 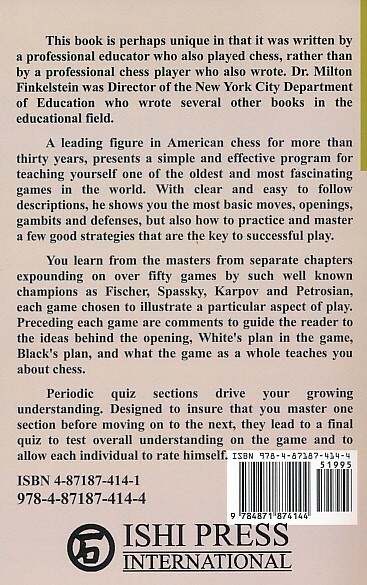 Preceding each game are comments to guide the reader to the ideas behind the opening, White's plan in the game, Black's plan, and what the game as a whole teaches you about chess. Periodic quiz sections drive your growling understanding. Designed to insure that you master one section before moving on to the next, they lead to a final quiz to test overall understanding on the game and to allow each individual to rate himself.